This is a fantastic combination of flavours and colours. 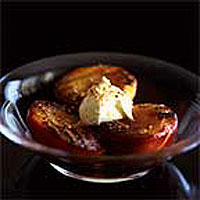 You could use other stone fruit, such as peaches, plums or apricots. The key to success with this dish is to preheat the griddle pan so that it is smoking hot. This will stop the fruit sticking too much. Preheat a stove top griddle pan until very hot. Halve and stone the nectarines. Place the fruit, flesh side down, on the hot griddle. Grill for one minute, or until there are dark griddle marks on the fruit. With a palate knife, remove the fruit from the grill. Put the nectarines in a roasting tray, cut side up. Drizzle the orange juice over them. Remove the seeds from the vanilla pods with the tip of a knife. Mix the seeds with the Amaretto and sugar, and pour over the fruit. Bake until soft - about 15 minutes. Serve hot or cold with biscotti and cream or crème fraiche, or try with the yoghurt and pistachio cake.